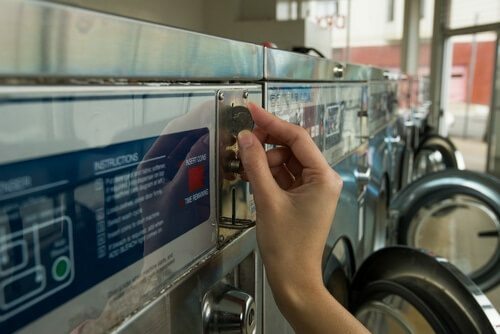 With the cost of Hydro and Gas on the rise and plummeting, it is so common that an average household nowadays, consider washing their clothes at a Coin Laundromat to save on their utility bills and also their valuable time. Coin laundry, also known as laundromat, is laundry facility wherein people pay to use washing machines and dryers to wash or launder their clothes. The business gets its name from the fact that it is operated by use of a coin just like a typical Vending machine. Now the business owner could decide to have it on small scale level, whereby people just come in and launder the clothes themselves, or he/she could decide to expand the business and include dry cleaning. The main difference from the regular washing machines is that they are coin operated. In some of these facilities, you will find few or no employees at all. The employees come in once in a while to ensure that the machines are in order and also to empty the coins from the machine. In such cases, the machines are fitted with gadgets to convert bills into coins. Other facilities prefer to have employees attending to the clients personally. Most people prefer this as opposed to the unattended machines. This is because they can get assistance if they get stuck. It also diminishes the chances of theft. The price charged depends on the business policy and also the quality of machines. On top of this coin laundry also make money by selling laundry products too. These can be purchased by inserting coins into the machine. Since you, as the customer, will be required to do the laundry yourself, it is essential that you know how to do it, and do it right. 1. To begin with, check that the washing machine or dryer don’ t have any articles or clothes left by the previous user. Check if it’s clean and wipe or clean first before using. 2. The next thing to do is sort your clothes and put your clothes separately as you put then into the machines. You could sort by whites, colors, bulk or large items like towels, etc. You could also opt to use a mesh bag to put smaller delicates like bra’s etc.. so that they don’t tangle with the rest of your laundry. 3. After this, set the Cycle Specification .This can be done by operating the buttons or knobs that are found at the front of the machine. The specifications are in term of either cold, warm or hot water. You can also determine the pace of the cycle. 4. Put on soap. For some machines there are options for pre-wash powder or liquid detergents, bleach and softeners. 5. Insert coins into the allocated coin slot. Do not use paper money. If you do not have coins ensure that you first convert the bills into coins first. 4. Finally, close the cover of the machine press Start. Give it adequate time to complete the entire cycle. Usually washers took around 30mins to complete, depends on the size used. 1. It conserves water. Regular washing machines will use about 120 quarts of water (30 gallons) for every round. Commercial coin laundry machines on the other hand use about half of this amount. 2. This commercial machines are big enough to hold large amounts of laundry and this takes a much shorter time as compared to using a small washing machine. 3. Most of this facilities have attendants on standby in case you encounter a persistent stain. 4. When you do the laundry you avoid clothes mix up and actually get to do your laundry exactly as you like it.